We all want a total car makeover every once in a while to see our vehicles come to life, whether for our own personal pleasure or for business and marketing purposes. By sticking large sheets of printed customised designs, or plain coloured vinyl sheets to your vehicle we create a totally different, attractive design, which technically wraps your car or van. A neat, attractive and professional looking vehicle wrap can do just the trick. Vehicle Wrapping turns around any vehicle 180 degrees for a low cost and little time. The fashion of sticking little logos or phrases on your rear windshield is wearing off; the revolutionary vehicle wrapping makeover is here! 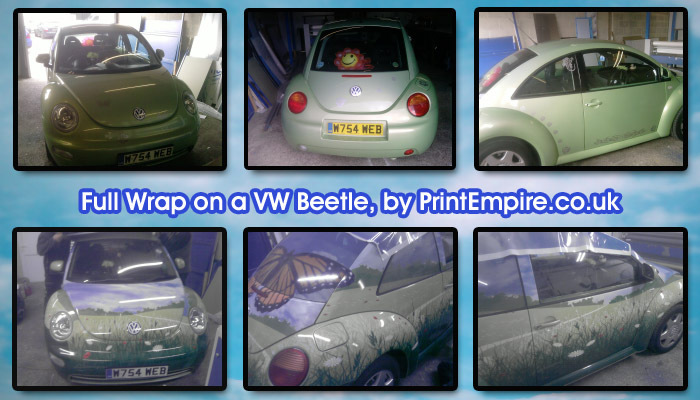 Print Empire are a vehicle vinyl wrapping company based in Berkshire. We turn around all types of vehicles, such as vans, cars, fleet, motorbikes, double deckers and golf carts. Our vehicle wraps protect the paintwork of your vehicle which keeps the resale price of your vehicle as high as it can be. Vehicle wraps makes a faultless first impression, especially if you are displaying your corporate identity which would make your vehicle stand out in the crowd and spread the word about your business. All eyes will be caught by your vehicle wrap increasing awareness about your business to the max, as if you are conducting your own marketing campaign on a low budget and reaching the best results. It is cost-effective as you will be displaying your advertisement everywhere you go, to meet your client, to the shops, or any personal errand. You can display your new product, promotion, business events, sale or simply your company’s logo. Professional vehicle wraps maintains the connection between you and your target market by keeping your business news and promotions fresh by the day. The majority of consumers employ a company’s services based on its look; they would judge your office, vehicles and stationary. With our Vehicle Wrapping service, everywhere you drive we would raise awareness for your business using the Print Empire car wraps. Advertisement display on vehicles is a technique used by many leading companies nowadays, which we will offer you for a fraction of the cost paid by those companies for their marketing campaigns. This Vehicle Wrapping service provided by Print Empire is a family-run business, so our utmost goal is the end result and its quality. We can design your wrap in any way you like, signage, logo, full color wraps, partial wraps, special finishes like carbon fibre or reflective silver or gold, or any other personalisation you prefer. Our designs are not standard, they are customised, so you will have your own unique look and your business would be exceptionally presented. The vinyl Car Wrapping service is for personal pleasure, as well. If you would like to express yourself and display your photo or any design over your car – provide us with the brief, and our professional design team will bring it to life for you! Just personalise your vehicle to suit your taste, as you personalise your home or room. Show your friends and neighbours your personal taste and unique touch, and stand out in any crowd. Who could believe that all these benefits are merely from having a whole new look to your car that is affordable and quick? Applying a vehicle wrap is quicker than painting and can be as short-term or long-term as you like. If you choose to remove your vehicle wrap you would see that your original paintwork is as perfect as the day we applied the vinyl. We use safe vinyl equipment, unlike the harmful and costly sprays. Vehicle Wrapping service has its special equipment and guarantees the best quality, with a warranty on our wraps. We offer you free consultation before applying your vehicle wrap to customise your design and make it as unique as you like. It’s incredible how far technology has come in such a short space of time. Only 5 years ago you would have struggled to grasp the idea of having full colour graphics printed all over your car or van. Best you could hope for was simple shapes and text cut-outs, being placed over your vehicle; with information such as company name, phone number – basic signwriting really. As technology has progressed and new machines have entered the market, from the likes of Roland, HP, Mutoh, and Mimaki; it is now possible to print on large format vinyl using specialised eco-solvent inks. You can literally take any design idea and concept, create it in a design suite, and within just a few hours that design can be plastered all over your vehicle. Car Wrapping, Vehicle Wrapping, Vinyl Wraps – these are now the most sought after ways of getting your brand out there, cost-effectively. Imagine, most people drive on average 1000 miles per month, sometimes up to 5000 miles if it’s a commercial vehicle – and with over 3000 other people seeing your vehicle each day, is it not worth investing in making your vehicle stand out – rather than driving a plain looking van, with no indication of what your business can offer. Having full colour vinyl vehicle graphics, covering some or all of your vehicle is a cost-effective marketing/advertising exercise; you can show off your offers, services, contact details all over your vehicle….it also protects the paintwork underneath so it is in pristine condition when the vinyl wrap is removed in future. 1) Does the vinyl ruin the paintwork? :: No. In fact, it protects the paintwork underneath from rain and sun damage; when the vinyl is taken off and the car is rinsed, the finish is immaculate – perfect if the car needs to be returned to the dealer after its lease period or you want to sell the vehicle. 2) What is the cost of a full car wrap? Is it expensive? 3) How long will you need my car, and where do I drop it off? :: Once we have approved the design ideas with you over email and phone, we will book in a date for you to drop the car off with us. We usually need the car for 2 days maximum, unless it is a fleet of vehicles in which case we can give you an exact duration beforehand. We can do you car wrapping / vehicle wrapping over weekends also if it is more convenient for you. We will confirm details with you on booking – we have a secure warehouse in Bracknell (Berkshire) which we ask you to drop your vehicle off to; once completed, we give you a call to come collect…simple! 4) Can you do vehicle wrapping at my premises? :: We would prefer you to drop your vehicle off with us, but if you need us to come to you that is not a problem, we can bring our equipment to you, although there will be additional costs to incur due to travel/time etc. Also, your premises needs to have good lighting, and be clean to work in. 5) What does the car wrapping service involve? :: Consultation with client on what they require … design concept created by us or the client … designs approved … print on to specialist vehicle vinyl … apply to the vehicle ensuring there are no creases or bubbles … client approves and signs off final work … vehicle is taken away by the client. 6) What print equipment do you use for the vinyl wraps? :: We use a Roland SolJet, quite likely the best large format vinyl printing machine on the market. It uses vibrant and rich eco-solvent inks which won’t fade. We’ll soon be putting a video of the machine in action, but you can search it online too – it really is a very impressive piece of kit … with no compromises on print quality and speed! 7) Rather than printing on vinyl, can I have solid colour vinyls over my car? :: This is something we do very often – clients who want a car wrap on a personal vehicle – with the new ‘matt black,’ ‘reflective gold,’ and ‘reflective silver mirror’ vinyls. We also offer about 80 other shades/colours you can choose from (i.e. have the car wrapped in red vinyl, and the centre section bonnet and hood wrapped in stealthy matt black). You can choose any combination of colour(s) and we can make your car stand out from the rest when you’re driving. 8; Is vehicle vinyl more expensive to buy than normal vinyl? :: Many people are not aware of the differences between ‘vehicle grade cast vinyl’ and ‘calendered vinyl.’ Ordinary vinyl is usually about 100 microns thick, and is used for sign-writing on vehicles and mainly for making signs (i.e. sign boards, shop front boards etc). It is ideal for this use as the vinyl is used on flat surfaces and can be applied easily without any problems. On the the other hand, we all know that vehicles do not have many ‘flat surfaces’ – they’re made up of rivets, curves, and some flat areas. For this, we use special vehicle grade cast vinyl, which is only 50 microns thick, allowing us to place over curves without any creasing or bubbling. We are aware of some companies still using normal vinyl for car wrapping (as it is a lot cheaper and saves them money), so whatever company you decide to use make sure you ask what vinyl they use; we have colour swatches and vinyl in stock, so you can confirm for yourself that we only use vehicle vinyl … for the best results. Also, be aware that calendered vinyl only has 1-3 year life indoors (around 1 year on vehicles); and specialised vehicle vinyl has a 7-9 year outdoor life! We hope the questions/answers above help with any of your own queries. You may have your own question on custom car wrapping, so please feel free to leave your comments/questions below for us to answer. We will soon add more photo of car wrapping we have carried out, as well as videos on the process, so keep an eye out for those! You are currently browsing the archives for the Vehicle Wrapping category.